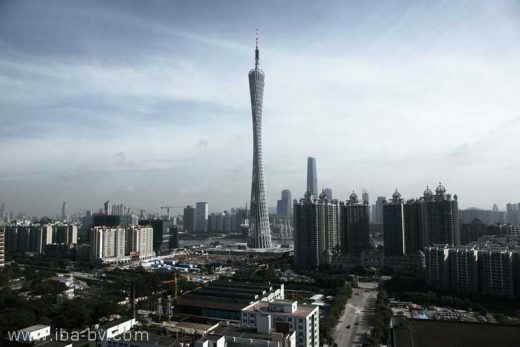 The city of Guangzhou has almost completed the work on what will be one of the tallest buildings in the world – Information Based Architecture (IBA) and Arup worked collaboratively to win the commission for the design of the new TV Tower for the City of Guangzhou, which will be the host city for the 2010 Asian Games. The tower will be one of the tallest buildings in the world – reaching 610m in height and is hoped will attract 10,000 visitors daily. We designed a 610-metre-tall twisted, tapering tube. The form, volume and structure are generated by two ellipses, one at foundation level and the other at an imaginary horizontal plane just above 450 metres. The tightening caused by the rotation between the two ellipses forms a ‘waist’ and a densification of material. This means that the lattice structure, which at the bottom of the tower is porous and spacious, becomes denser at waist level. The waist itself becomes tight, like a twisted rope; transparency is reduced and views to the outside are limited. Further up the tower the lattice opens again, accentuated here by the tapering of the structural column-tubes. A deck at the base of the tower hides the giant building’s functional workings. All infrastructural connections – metro and bus stations, and a pedestrian link to the northern embankment of the river – are met underground. This level supports other facilities as well, including a museum, a food court, extensive commercial space, a 600-vehicle parking area for cars and tourist coaches. The entrance operates on two levels, one a continuation of the landscape above ground, the other connected to the mass-transit and underground-parking facilities. Slow-speed panoramic and enclosed high-speed double-decker lifts serve both entrance levels. The intermediate zone form +80m up to +170m consist of facilities like a 4D cinema, a play-hall area, restaurants, coffee shops and outdoor gardens with teahouses. An open-air staircase, the Skywalk, starts at the height of +170 metres and spirals almost 200 metres higher, all the way through the waist. The top zone of the building begins above the stairway, housing various technical functions as well as a two-storey rotating restaurant, a damper and the upper observation levels. 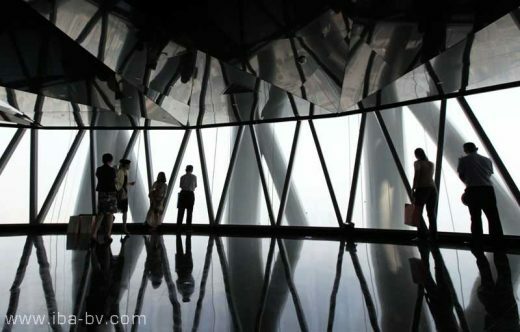 From the upper observation levels it is possible to ascend even higher, via a further set of the stairs, to a terraced observation square rising above the tower’s top ring, high above the booming city of Guangzhou. Spatially the tower reads like a series of mini-buildings hung within the super-structure, with ‘mega spaces’ in between These mega-spaces in between the mini-buildings are in fact floating gardens each varying in atmosphere; transparent, light and open at the base, and more closed and shaded at the waist of the tower. Between level +170 meter and level +350 meter an open air staircase will lead the public all the way up through the narrow waist of the building. Here visitors can investigate the structure from close by while they are given a physical experience of the size of the tower. The structure consist of a open lattice-structure that is twisted over it’s axis, therefore creating a tightening waist halfway up the building. This twist has created a slender grace-full profile. The design of the lattice-grid is not only a structural one but is also driven by esthetic and architectural and environmental considerations. The build ability of the nodes was an important challenge while designing the 610meter tall Guangzhou TV and Sightseeing tower. Although none of the 1100 steel nodes are identical, still we succeeded in creating one single type of node. Since the initial winning of the scheme, the design has been developed and wind tunnel tests, fire- and load tests have been completed. Performance-based approaches have been adopted to achieve breakthrough on the local regulations on planning, fire escape and structural design issues. The groundbreaking ceremony took place in November 2005 after which the foundation and piling, (24 x 4m diameter piles) have been constructed. About 90% of the steel-structure has now been assembled above ground. 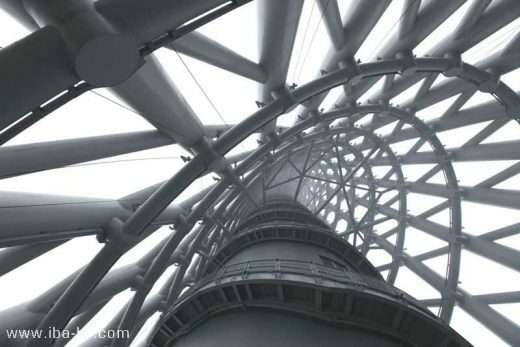 Recently the core of the Guangzhou TV & Sightseeing tower has topped off at 454m while the steel structure has also reached the top deck, which leaves only the nmast to be constructed. The tower is due to be completed at the end of 2009, in order to be fully operational for the 2010 Asian Games. It was in 2006 that the city of Guangzhou won the competition to become the host of the Asian Games in 2010. There were fireworks from the top of the Guangzhou TV tower to celebrate this. 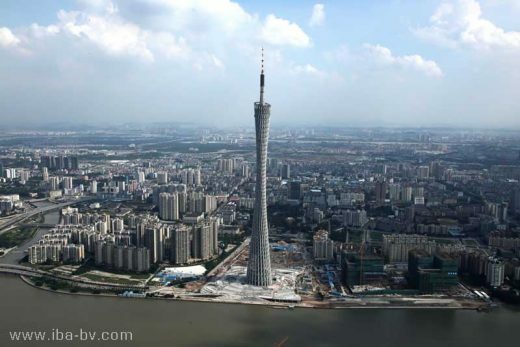 The top deck of the Guangzhou TV tower was reached on the 28th of November 2008 completing the steel outer structure. Information Based Architecture (IBA) was set up in London in 1998 as a partnership between architects Mark Hemel and Barbara Kuit. The practice specializes in architecture, urbanism and design, and was short listed in 2002 for the Young Architects of the Year Award in the United Kingdom. In 2002 and 2003 the office received a research grant from the Netherlands Foundation for Visual Arts, Design and Architecture. Currently based in Amsterdam, the Netherlands, IBA continues its work on both large and small projects in Europe and Asia. The work includes urban master-planning and studies, architecture, landscaping and furniture design. Mark Hemel teaches at the Architectural Association in London where he has been Unit-master since 1999. Before setting up practice, Barbara Kuit worked as a local architect on projects of Philippe Starck in London; the Sanderson and St Martin’s Lane hotels, and subsequently worked at the office of Zaha Hadid for several years on many projects among which; the Mind Zone in the Millennium Dome, the Contemporary Arts Center in Rome and Wolfsburg Science Center.